Check out the Sponsors classified for info. Can’t find the info. What’s the scoop? In the sponsors classified, you can see the dates, etc. It will be an outfitted hunt, March 2-9, 2019. Central Texas hill country. Tents, food, bait, stands, and transportation at the ranch will be provided. We can pick up hunters at the San Antonio airport on the 2nd. Cost is $700.00 plus $48.00 for a 5 day license. A $350.00 deposit will hold your spot 5 hunters total. Have 2 so far. Call me at 618-283-3954 for details. Still have a couple spots open! Check out the sponsors classified. If it was one week later I’d be in. I will check this out later today..
Can you not find the sponsors classified sir? Back from Texas, had a great time! Due to cancellations, there were only 3 of us for the week. We saw lots of pigs ( in the day light), and had multiple shots each. I had a missed shot during a stalk on a large sow, but made a 20 yard double lunger on a small boar while coming up from a creek crossing. I had made a small hole bait the day before to see if pigs were using an area along a large creek. As I neared the bait area, I spotted a brown boar hog. 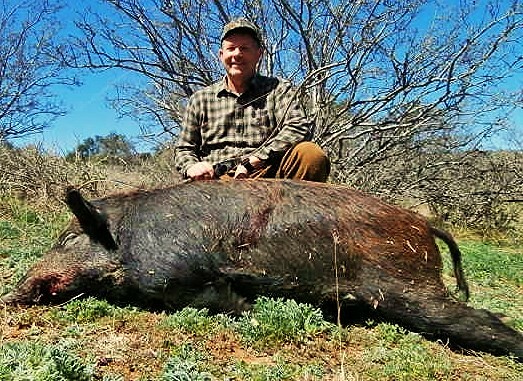 As I put an arrow on the string, the brown hog moved out of sight, and a dark boar with white feet moved into a small opening in the brush, and stood quartering away from me at 20 yds. The arrow was on its way before I had time to think about it. It struck a little high and back, but the angle looked good, except that I was shooting uphill. I backed out and went back to camp to give the pig 4 hours. Could have gone right after him, as the Tuffhead tipped arrow got both lungs and shattered the far leg. He was laying dead about 50 yards down the trail into the bush. Nice! Did Rick make it down with you? Rick was there for both weeks. I’ll let him tell you his story. We always have a great time at the ranch, and the time goes by way too fast. After seeing the results of the hit on my pig, and also participating on long fruitless blood trails from broadside shots; I think I will try for quartering away shots from now on. The vitals on a pig are so small and forward, it’s hard to be sure you get both lungs with a straight broadside shot. A quartering shot seems more effective and the run afterward seems shorter. The area we hunt is so thick, trailing is very difficult, and you can walk a few feet from a downed animal without seeing it. Shorter trails are much more likely to be successful, especially on shots where there is little or no blood. Chuck, thanks for hosting the Pig Hunt! When this Pig Hunt opportunity first came up in the Sponser's Classified, I was very interested! Having only a couple of pig hunts under my belt, and being somewhat of a novice pig hunter, I called Chuck for more details and questions. Needless to say, after our conversation, his responses confirmed to me that the hunts would be during the daylight hours, and that's what I wanted to hear! My goal was to observe the hogs coming in during the day. And, this was the type of hunt I had envisioned! Fast forward to the hunt. Upon arriving at our appointed location, I met Chuck, and his longtime friend Rick in Mason, Texas and had lunch. Have you ever had Texas barbecue? This is what you can expect. From the first day to the last, (with the stand placement by Chuck), I had plenty of shot opportunities. First day found me at the "Screaming Eagle" site. (Every site location had a name.) At around 6:00 pm there were pigs coming across the creek and up the draw. A good 20-30 pigs. With so many pigs, I finally had an opportunity on a lone pig just yards from where I sat. As I released the arrow, I heard a loud crack and the pigs ran everywhere! It was then that I realized that the top limb of my bow hit a branch directly in front and above me. The arrow hit the pig a little high. I headed back to camp for the evening in hopes of returning the next day to look for the pig. The next day we got up and went to rebait the sites and look for the hog I hit the previous evening. It didn't take Chuck long to track the blood trail down to the creek. The only one of us wearing rubber boots was Rick (Fletcher) so he went to the other side to check for more blood signs. At that point, I realized how difficult and tough these pigs could be! Fast forward to the last day. After previously deciding to hunt mornings, I went to another site. Within thirty minutes, I had a sounder of young pigs come in. It was a sight to behold! Sitting in the stand watching the youngsters eat was quite an experience! It wasn't long before two adults came in. The bully of the group would not present himself for a good shot - so I opted for the other pig. The shot looked great - it was quartering away - and that's when the pigs ran. After waiting for what seemed to be forever - I got down from the stand and found my arrow. It looked to have quite a bit of blood. I left the area and went to get Chuck. We came back. Trailed and tracked looking for the pig. Up and down. Over and across. Through the thickets with no success. At that point we had exhausted all avenues and it appeared that the pig crossed over into another property. It looks like ton of fun Congratulations to folk that shot hogs. Wrapping up, I want to give a BIG thanks to Chuck as well as his friend, Rick (aka Fletcher) for making this a great hunt! I learned a lot about shot placement and how difficult hogs are to take down! Learned a lot. Saw a lot. Lots of memories were made! If the opportunity arises again next year, I'd be all over it! Again, thank you Chuck and congratulations on the pig you got.